This is the latest European skin tightening innovation from Manchester England. Biorestoration is proud to introduce to the United States this phenominal treatment to bring a more youthful appearance to your face, arms, abdomin and buttocks. You will be amazed and excited to see the results that can be achieved with a few treatments that are affordable and relatively pain free. Call today for introductory pricing on a treatment package. You will be glad you did. There’s no recovery time. You can even do it on your lunch break. The facial skin is made up of three distinct layers: a visible outer layer on the surface called the epidermis, a collagenrich underlayer beneath the surface called the dermis, and an inner layer beneath the dermis called the subcutaneous layer, also known as the fat layer that has a web of collagen fibers running through it. When the collagen in these three layers breaks down due to sun exposure, family heredity, or the normal aging process, your face begins to sag and wrinkle. Naturally, treatments that work on just the surface can’t do anything to restore the collagen in the underlayer or the innerlayer of your skin. Thermage is the only non-invasive procedure available that tightens and renews your skin’s collagen in all three layers. How? 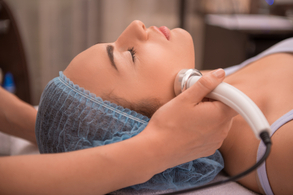 Thermage’s unique Capacitive Radiofrequency (CRF) technology safely heats your skin’s underlayer and the web of collagen in the inner layer, causing an immediate tightening as well as improved tone and texture. And the improvements will continue and become even more noticeable for four to six months following treatment due to new collagen growth. The Body Shape procedure is ideal for men and women who are not significantly overweight and are looking to help firm sagging skin and reduce unwanted bulges that dieting and exercise alone cannot seem to change. Results vary from subtle to dramatic. Generally, some improvement is immediately visible and continues for up to six months. Results are long lasting depending on your skin condition and the aging process.